A Gutierrez, R Velasquez, M Iriarte. Analysis of clinical course in term patients with early and delayed umbilical cord clamping after birth. The Internet Journal of Pediatrics and Neonatology. 2009 Volume 11 Number 2. Background – The optimal time of cord clamping has been a subject of heated discussion. It has been reported that placental transfusion occurs primarily at 10 seconds after delivery, therefore immediate cord clamping may deprive the newborn of blood. Material and methods – Two hundred term newborns born over a two-month period were divided into two groups: group A with immediate cord clamping and group B with clamping at 10 seconds after birth.Results – At least one morbidity event was recorded in 35% of patients in group A and in 8% of patients in group B.Discussion – The time of delay was based on reports that 5% of circulating volume can be transfused at 10 seconds after birth without risk. Morbidity was higher in the group with immediate cord clamping than in the delayed clamping group.Conclusions – Delayed cord clamping is a safe procedure with beneficial effects for the newborn. The optimal time of cord clamping has been the subject of discussion for many years. 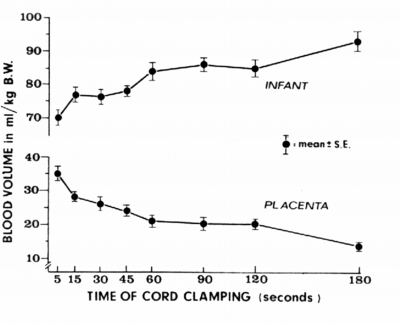 In 1968, Walsh and Yao began a scientific analysis of the physiologic effects of delayed cord clamping, showing that the time of cord clamping has hemodynamic effects in the newborn and that immediate cord clamping deprives the newborn of a significant blood volume. (1,2,3). When the fetus is in the uterus, the pulmonary circulation is diminished since blood flow goes through the foramen ovale and the ductus arteriosus. Immediately after birth, cardiac output to the lungs increases from 8% to 45%, requiring transfer of an adequate blood volume. At birth, the red cell volume by kg of weight is similar in term and preterm newborns. The great variability in blood volume, red cell volume, and hematocrit observed during the neonatal period is due to variation in the placental transfusion volume following birth. 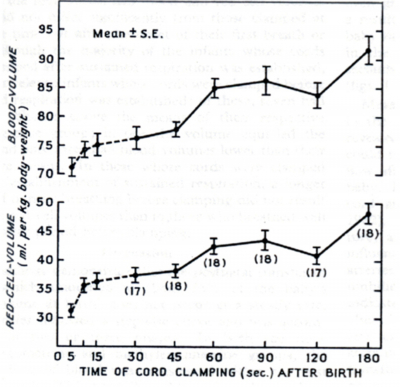 (9) The increase in blood volume after birth may be predicted in relation to the time of cord clamping (Figure 1). A delay in cord clamping of 10 seconds allows the circulating blood volume of the newborn to increase by 5%, allowing good expansion of pulmonary capillaries and favoring a decrease in pulmonary resistances and pulmonary fluid absorption without adverse effects in the newborn. This study involved 200 term infants born at the Hospital Angeles del Pedregal over a period of two months. The patients were divided into two groups, each with 100 patients: Group A, in which the umbilical cord was clamped immediately after birth, and Group B, in which the umbilical cord was clamped 10 seconds after birth. Exclusion criteria were: perinatal problems, congenital malformations, preterm delivery, Apgar score < 7 at one minute, advanced neonatal resuscitation. Weight, Apgar score, and hematocrit at 48 hours of life were registered. mean weight in group A was 2,909 g (range 2,060 to 3,700 g), and the mean weight in group B was 3,138 g (range 2,300 to 3,360 g). The mean hematocrit at 48 hours was very similar in both groups: 46.4% in group A (range 37 to 61%) and 48.3% in group B (range 42 to 65%). The mean Apgar score at one minute was also similar in the two groups: 8.4 for group A (range 7 to 9) and 8.6 for group B (range 7 to 9). None of the patients had symptoms of polycythemia. In group A, 35 patients (35%) presented at least one morbidity event and there were 87 events in total, a mean of 2.4 events per patient. 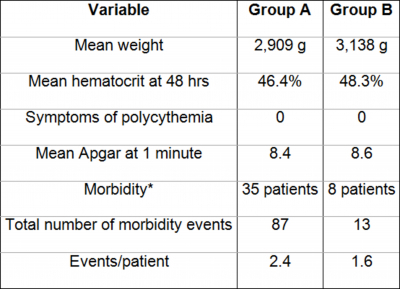 In group B, 8 patients (8%) presented at least one morbidity event, and there were 13 events in total, a mean of 1.6 events per patient. There was no significant difference between the groups in weight or Apgar score. There were no patients with symptomatic polycythemia and the average hematocrit was similar in both groups. These findings are consistent with those of Aladangady et al., who did not observe polycythemia or hypervolemia in babies in which cord clamping was delayed and support the report by Lainez et al. showing that hemodynamic changes produced by a delay in cord clamping do not increase neonatal morbidity. The incidence of morbidity was higher in the group with immediate cord clamping than in the group with delayed cord clamping (35% vs. 8%; 2.4 vs. 1.6 events per patient) . In this study, we decided to delay cord clamping by 10 seconds since Yao et al showed that 5% of the circulating volume transfuses at 10 seconds, whereas a delay of 45 seconds is associated with a further increase of only 5%. Moreover, with a delay of 10 seconds there is no risk of hypothermia, hypervolemia, delayed resuscitation, or interference with obtaining the blood cord sample for stem cells. Our results show that a 10 second delay in clamping the umbilical cord decreases neonatal morbidity in term newborns. Delayed cord clamping is a safe and inexpensive procedure with beneficial effects for the term newborn. 1. Yao A, Hirvensalo M, Lind J. Placental transfusion-rate and uterine contraction. Lancet. 1968;1:380-3. 2. Walsh S. Maternal effects of early and late clamping of the umbilical cord. Lancet. 1968;1:996-7. 3. Yao A, Moinian M, Lind J. Distribution of blood between infant and placenta after birth. Lancet. 1969;2:871-3. 4. Lainez B, Bergel E, Cafferata M, et al. ¿Pinzamiento precoz o tardio del cordon umbilical? Una revision sistematica de la literatura medica. An Pediatr. 2005;63:14-21. 5. Kinmond S, Aitchison T, Holland B, et al. Umbilical cord clamping and preterm infants: a randomized trial. BMJ. 1993;306:172-5. 6. Mercer J, Vohr B, McGrath M, et al. Delayed cord clamping in very preterm infants reduces the incidence of intraventricular hemorrhage and late-onset sepsis: a randomized controlled trial. Pediatrics. 2006;117:1235-42. 7. Aladangady N, Mc Hugh S, Aitchison T, et al. Infants’ blood volume in a controlled trial of placental transfusion at preterm delivery. Pediatrics. 2006;117:93-8. 8. Singhal N, Niermeyer S. Neonatal resuscitation where resources are limited. Clin Perinatol. 2006;33:219-28. 9. Saigal S, O’Neill A, Surainder Y, et al. Placental transfusion and hyperbilirubinemia in the premature. Pediatrics. 1972;49:406-19. 10. Klebe J, Ingomar C. The fetoplacental circulation during parturition: evidence from residual placental blood volume. Pediatrics. 1974;54:213-6.